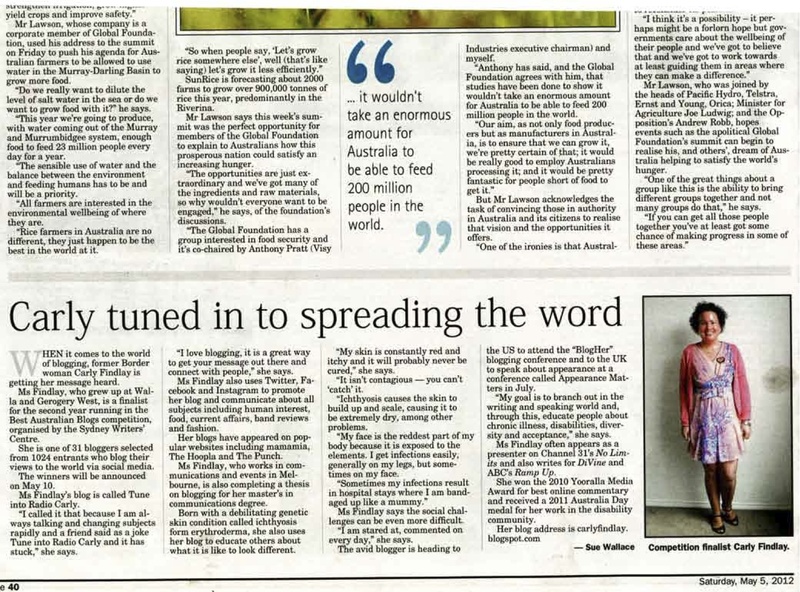 Tune into Radio Carly: Love Your Sister - the launch. 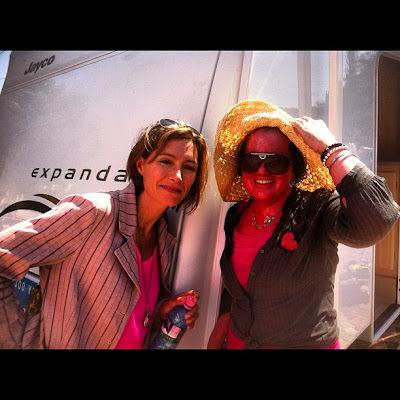 A pink akubra, Samuel and Connie, and a fangirl moment. Love Your Sister - the launch. A pink akubra, Samuel and Connie, and a fangirl moment. 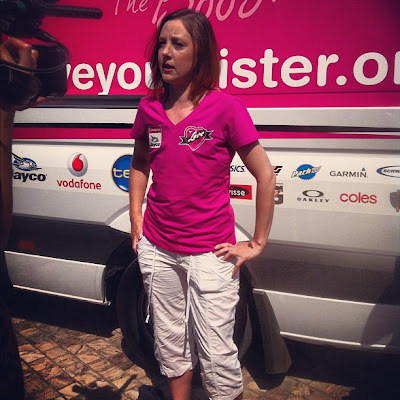 Friday 15 February was launch day for Samuel and Connie Johnson's charity Love Your Sister. 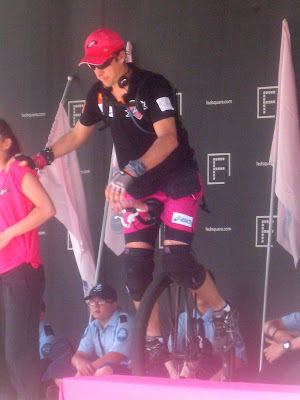 Sunshine and fanfare sent Samuel and his team off unicycling around Australia. 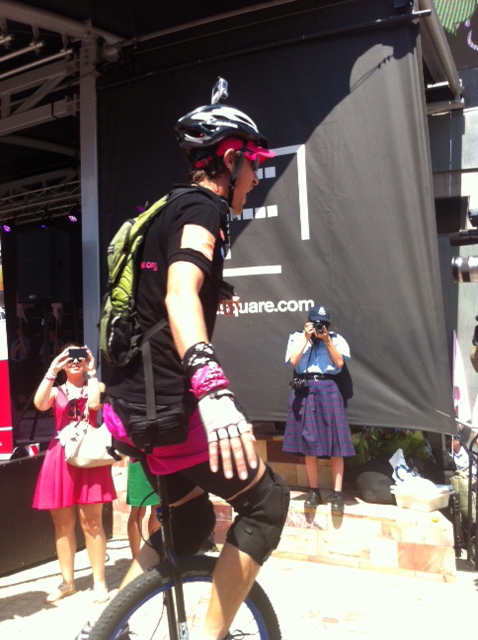 They'll be gone for a year - 15,000 km - to raise $1 million for breast cancer research and support. I chatted to Samuel about Love Your Sister in January - watch our chat here. Connie is in her mid 30s and has a husband and two beautiful little boys - she is dying of cancer. Samuel said that she wants this unicycle ride to be her legacy. ...and around the barrier for the audience. He was a little wobbly down the ramp and over the cobblestones, but he unicycled seamlessly on his third attempt - met with a round of applause and cheers. 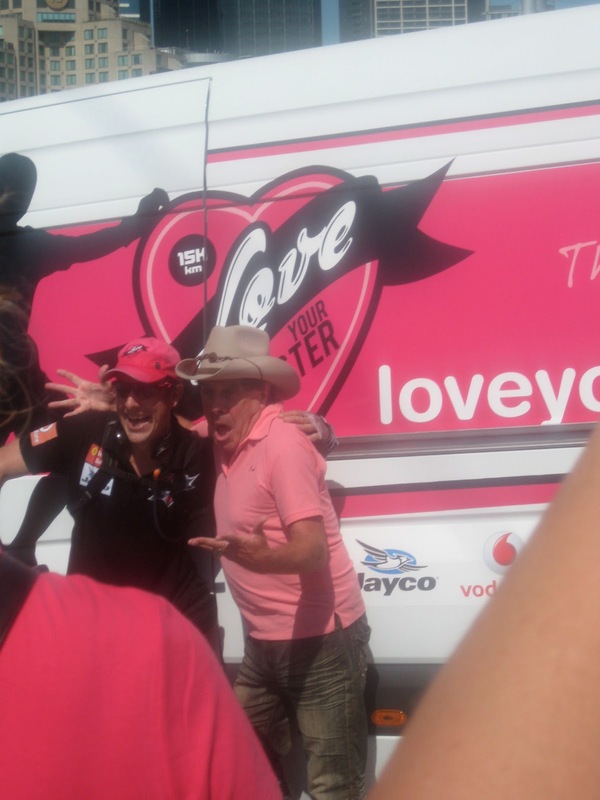 Molly Meldrum and Brigitte Duclos were the MCs of the event. Molly gave Samuel a pink akubra. I llove that Molly supported this cause - later on the stage, he presented Samuel with a message from another two iconic Australians - Kylie Minogue and Olivia Newton John, both who have fought breast cancer. I had a quick chat with Molly - he is really lovely. I told him how I was once in the lift at work with him - when he was off to the passports office, and he said "that'd be right". They were so so lovely - and after being a fan of their work for more than a decade, it was an honour to meet them. I didn't get a chance to meet Connie on the day - she was busy with media and family commitments. She spoke so eloquently - she is so beautiful and strong. Her message was clear - she doesn't want other young mums to fall into the booby trap - she encourages every woman to be breast aware and get check ups before it's too late. The crowd was huge by launch time. 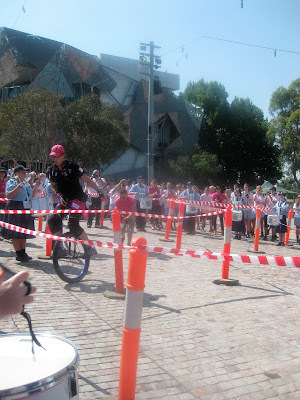 So many people came to support Samuel and Connie on Friday, and have continued to do so as Samuel's been unicycling around Victoria. The launch was very emotional. Molly and Brigitte spoke about Samuel and Connie's courage. A representative from the Garvan Institute spoke on stage about the way they support women with breast cancer and promised they will protect and love Connie while Samuel is away. And Connie spoke of her cancer journey and the love she has for her brother. She said she'll be here to see Sam return. I hope she is. The family are so close knit and to watch them say goodbye to Samuel was so sad. Leisa said I could use this picture, after my pictures of his send off weren't so clear. You can read her account of the launch here. The love, strength and spirit these siblings have is amazing. 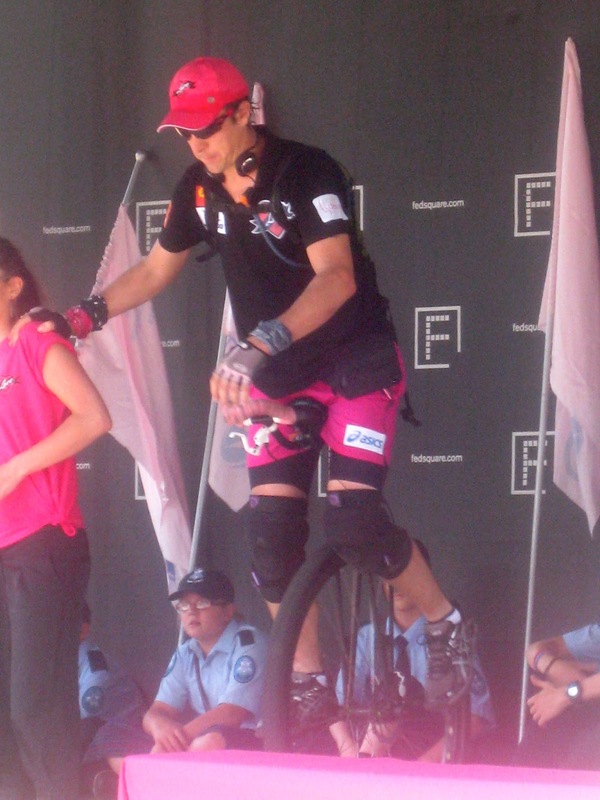 The reality of Connie's prognosis and Samuel's generosity of unicycling around Australia, certainly shows us how important it is to live life to its fullest, and to treasure your family and friends. 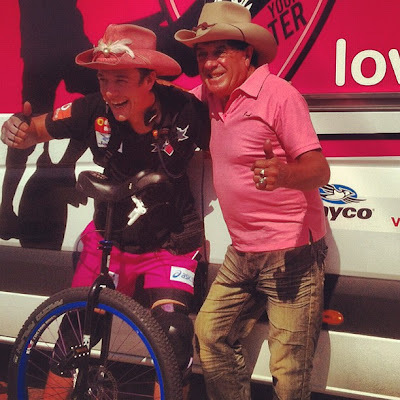 This video was shown on screen at Fed Square - it shows Samuel and Connie's journey, and the incredible support of celebrities, sponsors and strangers. For more information, updates on Samuel's unicycle journey and to donate, visit Love Your Sister's website, Facebook, Twitter and Instagram.